Islam's relation with Japan is quite recent as compared to those with other countries around the world. There are no clear records of any contact between Islam and Japan nor any historical traces of Islam's coming into Japan through religious propagation of any sort except for some isolated cases of contact between individual Japanese and Muslims of other countries before 1868. Islam was firstly known to Japanese people in 1877 as a part of Western religious thought. Around the same time the life of prophet Muhammad (PBUH) was translated into Japanese. This helped Islam to find a place in the intellectual image of the Japanese people, but only as a knowledge and a part of the history of cultures. Another important contact was made in 1890 when Ottoman Turkey dispatched a naval vessel to Japan for the purpose of starting diplomatic relations between the two countries as well introducing Muslims and Japanese people to each other. This naval vessel called "Ertugrul" was capsized and sank with 609 people aboard drowning 540 of them, on its way returning to home. The first Muslim Japanese ever known are Mitsutaro Takaoka who converted to Islam in 1909 and took the name Omar Yamaoka after making the pilgrimage to Makkah and Bumpachiro Ariga, who about the same time went to India for trading purposes and converted to Islam under the influence of local Muslims there and subsequently took the name Ahmad Ariga. However, recent studies have revealed that another Japanese known as Torajiro Yamada was probably the first Japanese Muslim who visited Turkey out of sympathy for those who died in the aftermath of the shipwreck of the "Ertugrul". He converted to Islam there and took the name Abdul Khalil and probably made pilgrimage to Makkah. The real Muslim community life however did not start until the arrival of several hundred Turkoman, Uzbek, Tadjik, Kirghiz, Kazakh and other Turko-Tatar Muslim refugees from central Asia and Russia in the wake of the Bolshevik Revolution during World War I. These Muslims who were given asylum in Japan settled in several main cities around Japan and formed small Muslim communities. A number of Japanese converted to Islam through the contact with these Muslims. 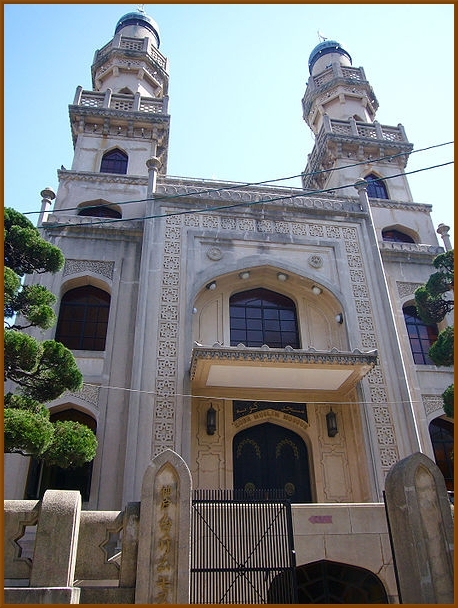 With the formation of these small Muslim communities several mosques have been built, the most important of them being the Kobe Mosque built in 1935 (which is the only remaining mosque in Japan nowadays) and the Tokyo Mosque built in 1938. One thing that should be emphasized is that very little weight of Japanese Muslims was felt in building these mosques and there have been no Japanese so far who played the role of Imam of any of the mosques. During World War II, an "Islamic Boom" was set in Japan by the military government through organisations and research centers on Islam and the Muslim World. It is said that during this period over 100 books and journals on Islam were published in Japan. However, these organisations or research centers were in no way controlled or run by the Muslims nor was their purpose the propagation of Islam whatsoever. The mere purpose was to let the military be better equipped with the necessary knowledge about Islam and Muslims since there were large Muslim communities in the areas occupied in China and Southeast Asia by the Japanese army. As a result, with the end of the war in 1945, these organisations and research centers disappeared rapidly. Another "Islamic Boom" was set in motion this time in the shade of "Arab Boom" after the "oil shock" in 1973. The Japanese mass media have given big publicity to the Muslim World in general and the Arab World in particular after realizing the importance of these countries for the Japanese economy. With this publicity many Japanese who had no idea about Islam got the chance to see the scene of Hajj in Makkah and hear the call of Adhan and Quranic recitations. Beside many sincere conversions to Islam there were also mass conversions which are said to have amounted to several tens of thousands of conversions which took placeduring those days. However, with the end of the effect of oil shock, most of those who converted to Islam disappeared from the scene. "In the coming few years there should be substantial developments for Islam in Japan,"says Nur Ad-Din Mori. "If not, then we cannot really speak of the future of Islam in this country." Mori maintains it is a turning point now because of the relatively recent return of five young Muslims to Japan after completing their studies on Islam in Arab countries. Two graduated from the Umm al-Qura University, Makkah, one from Islamic University, Madinah, one from the Dawa College, Tripoli, and the last from Qatar University. Though the number may not seem very impressive it is a significant increase in the Japanese scene where, before these five, only six students graduated from universities in Arab countries during the last twenty years, with three of them majoring in Arabic, not Islamic, studies. Mori, who studied theology and general Islamic studies in Makkah, is one of the recent five: he confirms their responsibilities." Islam is a religion of knowledge and we cannot stand well without learning. I think the efforts and activities made in this respect in Japan remain very minor up to this day." Mori's pronouncement also refers to another problem in Japan: there have been few who can teach Islam to the indigenous people in their own language. The history of Dawa in Japan for the past forty years has basically been that of efforts by foreign Muslims who happened to stay here in this mainly Buddhist country. The Turks have been the biggest Muslim community in Japan until recently. Pre-war Japan was well-known for its sympathy and favour towards Muslims in central Asia, seeing in them an anti-Soviet ally. In those days some Japanese who worked in intelligence circles had contact with these Muslims. A few opened their eyes to Islam through these contacts, and embraced it after the war ended. There were also those who went to Southeast Asian countries such as Malaysia as soldiers during the war. The pilots were instructed to say "La ilaha illa Allah", when they were shot down in these regions, so that their lives would be spared. Actually one of them was shot down and captured by the inhabitants. When he shouted the "magic" words to them, to his astonishment they changed their attitudes and treated him rather kindly. He has been keeping his words until this day. These are the Muslims of "the old generation". They found themselves as a minority group of Japanese Muslims after the war, and lived with already established foreign Muslim communities. Generally, the Japanese in those days had quite strong prejudices against Islam and their knowledge of international society was very limited. For example, in an article published in a magazine in 1958, the five pillars of Islam were described under the title "The strange customs of Mohammedans". The Japanese had a stereotyped image of Islam that it was "a strange religion of underdeveloped countries". Even these days, though modified and corrected in many respects, such an image has not died out. Just a few years ago, a famous writer in social affairs could say in a TV program that Islam is a religion whose followers worship the sun. A comparison of Japanese attitudes towards Christianity is interesting. Christianity has spread in Japan over the last hundred and twenty years as part of its Westernisation and is greatly respected even by those who do not adhere to its creeds. The population of Japanese Christians is one million, which constitutes less than one percent of the total population. Many of them, however, belong to be middle class and to intellectual circles, as demonstrated by the fact that the present Minister of Culture is a Christian writer, so their influence is much greater than their numerical strength may suggest. The spread of Christianity can be ascribed, not only to western influence but also to the long history of its presence in Japan, having arrived more than five hundred years ago.The spread of Islam went eastwards, from India to Malaysia and Indonesia, and was blocked after reaching the southern Philippines by the Spanish colonization of the North. From there, Spanish missionaries were able to carry their message to Japan. The Japanese invasion of China and South East Asian countries during the second world war brought the Japanese in contact with Muslims. Those who embraced Islam through them established in 1953, the first Japanese Muslim organisation, the Japan Muslim Association under the leadership of the late Sadiq Imaizumi. Its members, numbering sixty five at the time of inauguration, increased two-fold before this devoted man passed away six years later. The second president of the association was the late Umar Mita, a very dedicated man. Mita was typical of the old generation, who learned Islam in the territories occupied by the Japanese Empire. He was working for the Manshu Railway Company, which virtually controlled the Japanese territory in the north eastern province of China at that time. Through his contacts with Chinese Muslims, he was convinced of its truth, and became a Muslim in Peking. When he returned to Japan, after the war, he made the Hajj, the first Japanese in the post-war period to do so. He also made a Japanese translation of the meaning of the Quran from a Muslim perspective for the first time. Thus, it was only after the second world war, that what can properly be called "a Japanese Muslim community" came into existence. In spite of the initial success, however, later developments were quite slow in terms of membership. Though many Islamic organisations were established since the 1900s, each of them has only a few active members. There is no reliable estimate on the Japanese Muslim population. Claims of thirty thousand are without doubt an exaggeration. Some claim that there are only a few hundred. This probably amounts to the number of Muslims openly practicing Islam. Asked to give an estimate on the actual number of Muslims in Japan, Abu Bakr Morimoto replied, "To say frankly, only one thousand. In the broadest sense, I mean, if we do not exclude those who became Muslims for the sake of, say marriage, and do not practice then the number would be a few thousands." Apparently such a slow development is due partly to external circumstances. Japanese traditional religious atmosphere and highly developed materialistic tendencies must both be taken into consideration. But there are also shortcomings on the part of the Muslims. There exists a difference in orientation between the old and new generations. For the old generation. Islam is equated with a religion of Malaysia, Indonesia, or China etc. But for the new generation, these East Asian countries are not very appealing, because of their western orientation, and so they are more influenced by Islam in the Arab countries. "The old generation have lived closely connected with non-Japanese Muslims," points out Nur Ad-Din . "It is an excellent act in the spirit of brotherhood. But on the other hand, we cannot deny its side effect, that is, this way of life could not prevent other Japanese from thinking of Islam as something foreign. How to overcome this barrier is a problem to be solved. It is a task for us, the younger generation ." When visiting Muslim countries, the remark that Japanese Muslims are the minority religious group always brings a question from the audience, "What percentage of Japan's total population are Muslims?" The answer at the moment is: One out of a hundred thousand. Nevertheless, the younger generation has aspirations. Perhaps some day it will be said that Islam is a popular religion in Japan. The history of Islam in Japan reveals therefore some random waves of conversions. In fact, religious campaigns are no more successful for other divine revelations or "new religions". The statistics indicate that some 80% of the total population believe in either Buddhism or Shintoism while as few as 0.7% are Christians. The latest results of a poll conducted by a Japanese monthly opinion magazine imply however an important caveat. Only one out of four Japanese effectively believes in any particular religion. The lack of faith is even more pronounced for Japanese youth in their 20s with an alarming rate of atheism as high as 85%. The potential direct agents of da'wah represented by the Muslim community in Japan with its estimated one hundred thousand believers is itself extremely small compared with the total population of more than one hundred and twenty million citizens. Students together with various kinds of workers in precarious conditions constitute a large segment of the community. They are concentrated in big urban cities such as Hiroshima, Kyoto, Nagoya, Osaka and Tokyo but are seldom organised into established units in order to conduct effective programs of da'wah. In fact, the Muslim students association as well as some local societies organise periodical camps and gatherings in an effort to improve the understanding of Islamic teachings and for the sake of strengthening brotherhood relations among Muslims. There is a continuous need for Muslims to withstand pressures to conform to the prevailing modern lifestyle which appeals to the passionate element of the soul. Further difficulties are faced by Muslims with respect to communication, housing, child education or the availability of halal food and Islamic literature, and these constitute additional factors hindering the course of da'wah in this country. The duty of da'wah is frequently perceived as the single obligation on Muslims to preach Islam to non-Muslims. However, important calls for reform (islaah) and renewal (tajdeed) constitute also distinct forms of da'wah to Muslims. A betterment of the level of Islamic knowledge and living conditions of the Muslim community is therefore by itself the very da'wah needed in Japan. One should bear in mind however, that unless the attitudes of indifference and passivity of Muslim residents in Japan with respect to Islamic issues of congregational aspect are changed, the risk of the community being uprooted and diluted through severe distorsions of the Islamic belief will indeed grow higher. This likelihood is in fact pertaining to the permanent exposure of Muslims to the influence of many Japanese customs and traditional practices such as deep bowing as a form of greeting and collective participation in religious festivities and temple visits. The problem is perhaps being felt in more acute terms for Muslim children who, in the absence of any Muslim kindergartens or schools constitute indeed easy targets for the transmission and cultivation of unIslamic cultural and social habits. The remarkable lack of educational institutions of Islamic character is also reflected by the existence in all over Japan of a single mosque which resisted with fadhl from Allah s.w.t to the great Hanshin earthquake that nearly destroyed the city of Kobe on the wake of January 17 of this year. There are permanent efforts to build or transform housing units into masajids in many other cities and with the help of the Almighty, such good enterprises are expected to bear fruits in the very near future insha'Allah. The misconception of Islamic teachings introduced by the western media stands to be corrected in a more efficient approach that takes into consideration the significant feature of the Japanese society of being one of the world's most literate countries. Yet, because of poor distribution, even translations of the meanings of Quran into Japanese language are not publicly available. Islamic literature is virtually absent from bookstores or public libraries to the exception of few english-written essays and books that are sold at relatively high prices. As a result, it should not be surprising to find out that the knowledge of ordinary Japanese about Islam is modestly confined to few terms related to polygamy, Sunnah and Shia, Ramadhan, Makkah, Allah the God of Muslims and Islam the religion of Muhammad ! Will Islam echo louder in Japan ? With increasingly significant evidence of a responsible recognition of its duties and rational assessment of its limits and capabilities, the Muslim community is showing stronger commitment to accomplish its task of da'wah in a better organised fashion. There are indeed strong hopes that the future of Islam and Muslims will be better than their past inshaAllah as we believe that if Allah (s.w.t.) helps us, none can overcome us. 1. Islam in Japan: It's past, present and future. Islamic Centre Japan, 1980.